SB 827 could up-zone this area around the North Berkeley BART station. Updated: Who Backs Building on North Berkeley BART Parking Lot? As a disclaimer, I’m not categorically against any type of development, be it prefabricated, modular homeless housing or 100 story luxury apartments. If a city wants to build the tallest building in the world, that’s fine if it’s their decision to do that. What I am against is top-down planning by government and big money, forcing inappropriate development on defenseless communities, by commandeering local planning and zoning control and dictating to locally elected officials and taxpayers. I’m also not an “urbanist” or any other “ist” for that matter. I love great urban places as much as I love quiet small towns. Each has its unique and compelling characteristics, and I think we should work to preserve both. If I need a label, I guess I’m a quasi-Wrightian when it comes to planning and growth. As anyone who has read my first book or my work over the years knows, I believe that growth and planning requires complex solutions, incorporating a mix of low-density and high-density, enabled by technology so both have a much lighter footprint on the planet than either do at the moment. Berkeley has serious needs for shelter space, supportive housing, and available housing that is affordable even to persons with very low incomes. The BRIDGE/BFHP effort to develop the Berkeley Way parking lot has failed to produce a viable project. City Council has been asked to commit large sums of existing funds and to try to borrow more funds in pursuit of the Berkeley Way Project. In exchange, Council is told the project might, if nothing more goes wrong, be funded and permitted by the end of 2019. As a documentary film, Thomas Lennon's Sacred stands apart—a rare collaborative visual anthology created by more than 40 filmmaking crews working independently in 25 different countries around the world. Credit for the concept and the editing goes to Lennon, an Academy Award-winning director/producer. Remember when reporters caught Donald Trump using a "cheat sheet" complete with five talking points during a meeting with survivors of the Florida shoot shooting? I managed to grab a screen shot with a close-up of the memo clenched in Trump's hands and, sure enough, number five reads: "I hear you." But here's the surprise. 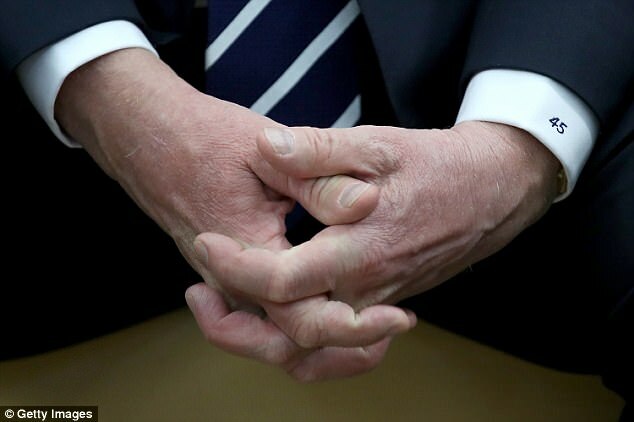 Look at Trump's left cuff. The number 45 appears on it. Do all president's have their shirts monogrammed thusly or is it just Trump? Is this to remind him he's the 45th POTUS? Or is it the caliber of the concealed handgun he carries? Or does he have a thing for old 45-rpm vinyl records? I'm wondering if the right sleeve is similarly marked.